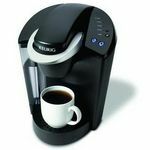 This coffee maker can do more than just brew coffee, it can be used to make iced-tea, apple cider, gourmet beverages, hot chocolate and others. It was designed by Germans and they did a good job, it is reliable and durable. Use it day-in, day-out, all week long with no issues. There is nothing special about the design and mode of operation but it has some features that make it endearing. The water tank and the cup stand is removable, so you don't have water spillage when trying to refill the tank. It has an LED that shows when to descale(clean) the unit and when to refill the tank. 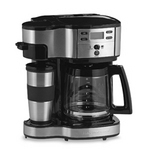 You press a button to brew, and the same button can be used to adjust coffee strength. Tassimo has bar-coded catridges that control the brewing so you get very nice coffee. Tassimo uses real milk for cappucinos and lattes and the frothing is just right. The machine permits multiple catridge brewing incase you want to make something assorted. There are limited variety of catridges, if you do not mind limiting yourself to the few available coffee houses, Tassimo is a great choice. 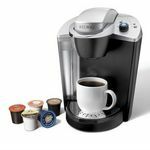 I bought this product for my husband for Christmas last year (2012), he wanted to be able to have a machine that he could make a variety of coffee's and latta's too. I make a cup for him every morning and he is never disappointed with the freshness or flavor. We love the Tassimo, it's "user friendly", easy to clean, and saves us money. My inlaws came to visit and enjoyed ours so much, they purchased one as soon as they got home. My mother does not drink coffee, but I showed her how it makes tea and other drinks as well. I bought her one this Christmas (2013) and it is all she drinks now. My only complaint would be that I can only find the coffee pods at Bed, Bath, and Beyond in my area, but I found where I can order them online. 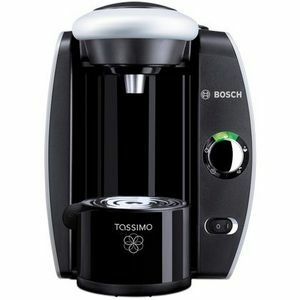 So, instead of going to overpriced coffee shops to get a great cup of joe, we recommend buying a Tassimo. You will not be disappointed!!! Tassimo is an overall great product and they care about their brand. Amazing versatile brewer with amazing features. I received my brewer as a gift three years ago. It has not failed me one time. Continues to make perfect single cups of coffee every morning. The bar code technology is amazing and unmatched by any other brewer on the market. The cost of the coffee disc's available are less than other brewer's also. I love this brewer. It works with smart technology and reads a bar code to customize each drink. Plus you can add or decrease the amount of water as well. So far our home has enjoyed chai tea, lattes, espresso straight up, hot cocoa and more. My son is even able to operate while I watch him. He is 8 and he loves his hot cocoas. I also love that there is a built in filter so I know each cup has the best water. Also it brews so fast! In no time at all my drink is ready to sip and enjoy. So it is also great for parties because I can give each guest what they want and pretty fast. It also has a nice compact size and sits on my counter. The only minus is that I wish the T-discs were not so expensive. I hope as Tassimo gets more popular, the costs will go down. 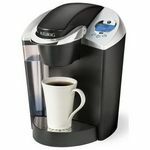 I purchased this brewer in replacement of my Keurig brewer two years ago. The main reason why I decided to get this instead is their Starbucks brand of lattes of coffees which they unfortunately discontinue. I was kinda hesitant about the Gevalia lattes and coffee disc but it turned out okay. I love that there is a separate foaming milk and espresso for their lattes/cappuccino. I had a problem with my first machine and they replaced it. It was actually a breeze exchange because they sent me new machine even before receiving the ones I returned. I encountered another problem regarding the excessive steam coming out all of a sudden and then the company replaced it again. There was also a previous problem about the coffee and milk spilling all over the place because of the disc security but the company fixed it by sending a new security clip for the disc. Cleaning and descaling is a bit tedious but a clean machine makes the coffee taste better. I love my Tassimo but I would love to have the Starbucks brand of t-disc. After suffering through 2, count them 2, Keurigs, I finally bought a Tassimo for my husband. We have it for about a year now without a single problem. The coffee always tastes amazing. We have tried all of the different types of drinks (latte, tea, cappuccino and even hot chocolate). So far there haven't been any that we don't like. The Chai Tea is my daughter's favorite, I go for the latte's and cappuccino's and my husband likes all of the rich coffees. Try one, I guarantee you will love it! Brew Performance Fast, fresh and steaming hot. We don't stop at coffee shops anymore since we get a much better cup of coffee from the Tassimo, for a lot less money. Ease of Cleaning Just wipe it down with a damp sponge or towel. No crevices to trap dust or coffee. Ours still looks like new. Ease of Use I can't program our Genie, but the Tassimo is great for the technology challenged. If you are just making a quick cup all you have to do is press the "start" button. Design It's compact and fits anywhere. We even travel with ours. Just tuck it into the suitcase and go! Changing the filter takes about 2 seconds. Durability With so many people in our household and visitors using ours, it has taken a few falls onto the tile floor. The Tassimo is bullet proof. My husband and I receive this from his brother aftr he had moved on to a french press. We have found that this is a perfect machine for the mid-afternoon pick-me-up that my husbands needs. We use our regular coffee pot in the morning for the large amount needed for use both and this for when either of us wants a single cup without having to figure out the amount needed for single cups. It is very convienent. I just wish that more stores carried the coffee disks. Brew Performance This machine is supper fast for brewing simple coffee and fancier drinks. It makes every cup the same. Ease of Cleaning All of the parts are easy to remove and clean. There is not a lot of little pieces that can get lost or make it hard to put back together. Ease of Use It is simple, put the disk in, close and hit start. The machine reads the code on the disk so it knows exactly how much water to use. It then move on to the next setting for steamed milk. It is alost idiot proof. Design It is very small and compact taking up very little counter top space. Durability Seems to hold up well for the amount of use it gets. Very easy to use, makes a great hot drink fast. It was worth the money as to what you'd spend in a coffee house. It does have some draw backs as to other 1 cup coffee makers you could make your own pods....this one you can't, you need the disc with a bar code. The drink disc are not sold everywhere and can be hard to find. It's made by Bosch so I believe this machine will last awhile. Brew Performance Turn machine on, place a cup under spout, pop a disc in, close disc door hit size you need/want and hit button. within a minute you have a hot steaming drink. It's as good as your name brand coffee houses hot drink. 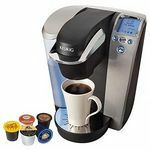 Coffee, Tea, hot coco, lattes, cappuccinos...It's a smart coffee maker and reads the disc and puts in the right amount of water. It has a water filter and keeps all the minerals out such as calcium which always manages to make my other coffee makers from working very long. Ease of Cleaning It's easy to clean, I place the disc holder into the dishwasher....I take the filter out of the water tank, place the plastic disc where the disc go and hit the button...I do this 4 rimes and the pot is clean! Ease of Use Turn machine on, place a cup under spout, pop a disc in, close disc door hit size you need/want and hit button. within a minute you have a hot steaming drink. It's as good as your name brand coffee houses hot drink. Design It isn't too big...Mine is Black with a chrome finish and it matches my kitchen appliances. It doesn't take up much room on my counter. The water tank is easy to fill and holds enough for several cups of your favorite drink. Durability So far so good....Haven't had it long. Being a Bosch product I imagine it will last for quite some time. My husband bought this on a whim because we love hot chocolate in the winter. I'll be honest, we are not coffee drinkers, so it probably wasn't the ideal investment, but, whatever. We still get quite a bit of use out of it. I do wish they had more than just two varieties of hot chocolate though. I would love to see a broader range of flavored hot chocolates or at least an option to add a separate "flavor cup". This little machine is super easy to use, just add water, pop in the little hot chocolate cup, position your cup or mug, press the button and you are good to go. It only takes about a minute or less and your drink is ready to go. So quick and so convenient. The flavor cups can be found in some grocery stores or you can order them directly from the website. 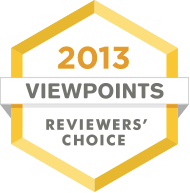 I purchase ours from my regular grocery store and they are pretty inexpensive. I also like that I can purchase the folgers cups for when I have company and need to only make a cup or two of coffee for someone. I would recommend this to anyone who is in the market for one of these types of machines.